There are plenty of clear, sunny days here in the Sunshine State, but we all know that living in Florida means you will likely be exposed to some extreme weather conditions, too. As hurricane season approaches each year, our team here at Hurricane Safe Products wants to encourage you to be proactive in protecting yourself, your family, and your property. When you know that a hurricane is approaching, emotions are high, and you will likely have a to do list that is a mile long. That’s why now is the perfect time to develop an emergency plan for yourself and for your family. Everyone can rest easy knowing that a plan is in place. Each emergency plan differs based on your family’s specific needs, but they should include some basic aspects. First, think about where you would go if you need to evacuate. Local shelters will be available, but many do not allow pets. If you or your family members have special needs, it’s even more vital to have a plan. Let your close family members know how you will keep them informed in the case of an emergency, and start a hurricane stash with paper products, medication, and other necessities. 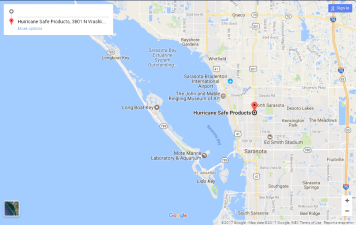 If you need to get your home ready, contact Hurricane Safe Products for assistance.